The Labrador cross Husky designer dog is a breed of many names: Husky Lab Mix, Huskador and even the Siberian Retriever. They are a delightful mix of their parent breeds. You can expect them to be high energy, loyal, intelligent, loving pups that would fit very well into an active household (as long as you don’t mind a bit of grooming)! Now, do not mistake these dogs for the purebred Labrador Husky. These adorable crossbreeds are an unpredictable mix of two of America’s favorite dog breeds. What is a Husky Lab Mix (Overview)? Is A Husky Lab Mix A Good Family Dog? How Much Do Husky Lab Mixes Cost? A Husky Lab Mix (Labsky) is a crossbreed of a purebred Labrador Retriever and a Siberian Husky. It doesn’t matter which is the mother and father, but it’s important that the parents are purebreds. Along with the Border Collie Lab Mix it is one of the most popular Lab Mixes. With both parent breeds being working dogs, they are a very high energy dog. These days they are not bred for any specific form of work, but rather as loving family pets. They are not currently registered with any Kennel Clubs because they’re a very new designer breed. The Husky Lab Mix is a wonderful dog that brings together the best characteristics of both the Labrador and the Husky and we’re sure will make an excellent addition to any suitable household. 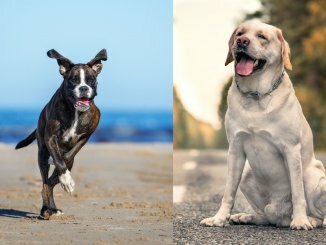 Being a cross breed, each puppy’s appearance will be a unique mix of the parent breeds. A Husky Lab Mixes’ coat can be a wide range of colors including black, yellow, brown, white, copper and grey. They can also be a beautiful mix of colors as often seen in Siberian Huskies. Another common trait found in Huskadors is heterochromia (i.e. having two different colored eyes); this is not harmful and occurs naturally. Labradors and Huskies are of similar sizes, so your Labsky will be a medium sized dog when fully grown. Its ears may droop like their Labrador parent or may stand up straight like a Huskies. Either way, they will be a stunning dog, sure to catch everyone’s eye. A fully grown Husky Lab Mix is classed as a medium dog and is likely to range from 40 to 60lbs. They will stand around 20 to 25 inches tall with males possibly being slightly larger than females. You can expect your cross breed to take on a mixture of their parents’ color. Their coats can range through black, brown, yellow, white, grey and copper. They can be block colored like the Labrador, or they can be a wonderful mix of colors like the Husky. Their coat is most often short to medium length and straight. As this beautiful dog is a Husky cross, they will shed more than the average pooch. Huskies have a double coat that keeps them warm in the freezing lands of Siberia. If your dog inherits this coat, they will shed their undercoat twice a year, which means you’ll be busy brushing them and the floor. The Husky Lab Mix is a cross of two fantastic dog breeds: the Labrador Retriever and the Siberian Husky. As they are cross breeds, they can inherit a mix of their parent breeds’ traits. To be safe, we shall run through the standard characteristics of both parent breeds to give you an idea of what your pup might be like. Labrador Retrievers were bred for, surprise, surprise, retrieving! They helped hunters collect the animals that had been shot and to flush out the ones still alive. Labradors are renowned people pleasers; so very easy to train and great family members. Siberian Huskies as working dogs are well known for pulling sleds and helping with hunting in cold climates. They work very well with people but can be much more stubborn when it comes to training. They also have a tendency to be very vocal so excessive barking could be a characteristic to expect. Both breeds are very intelligent and playful so any puppy will need a lot of stimulation to keep their minds engaged. Without this engagement negative behaviors can become a problem. For Labs this can result in chewing and with Huskies, digging. Huskies are also known for being fantastic escape artists so an enclosed garden is a must. Your Husky Lab Mix is very likely to be a people loving dog. They love people so will adore being around the whole family. If you work away from home all week or go on regular trips that aren’t very dog-friendly, this might not be the pup for you. These dogs are prone to separation anxiety and would much prefer to be with you as much as possible. This breed should be socialized with everyone and everything from a young age (more on this later). Husky Lab Mixes love to be around people and will thrive in a family environment providing they are consistently trained by everyone in the family. The Husky Lab Mix is a highly intelligent dog that will respond very well to positive reinforcement training. 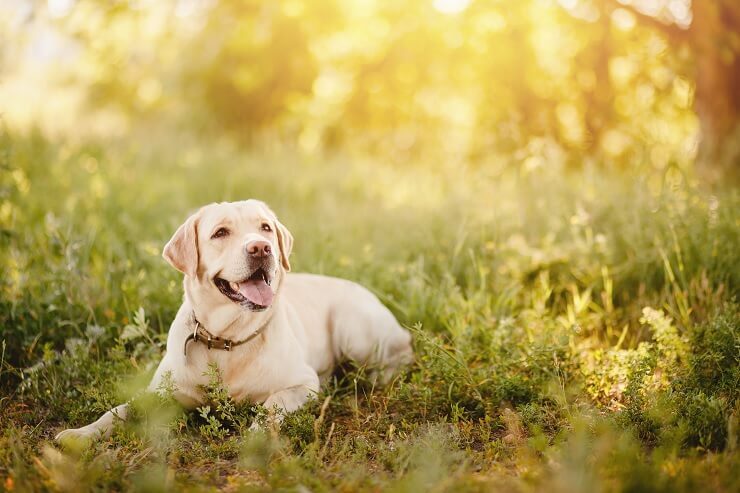 The hope for this breed is that the Labradors eagerness to please and quick learning capabilities will be the dominant personality trait when it comes to training. 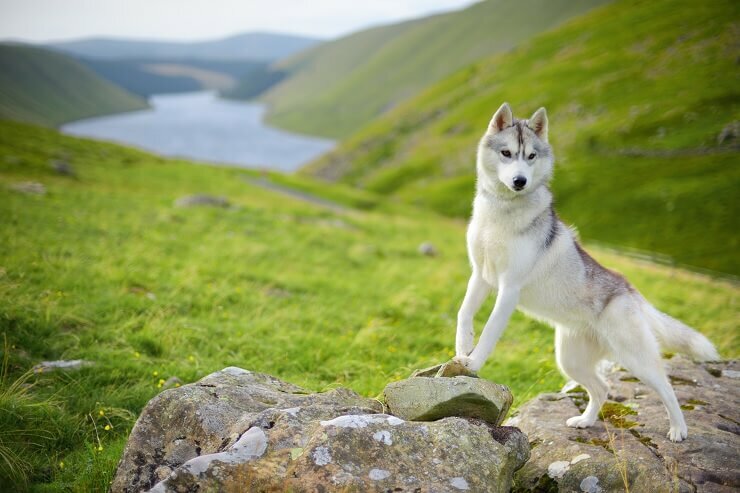 However, if your pup leans more towards the Husky temperament, you may have a bit more of a stubborn individual. Huskies are often harder to train as they have their own ideas of what they’d like to do. This stubbornness can be combated with lots of positive reinforcement, repetition and consistency in training. This breed is a very socially capable breed and will appreciate lots of socialization from a young age. Having your dog around adults, children and lots of other dogs will ensure that you have a very well rounded pup. Playing with other dogs is also great mental stimulation for them and will help to keep them entertained — so be sure to pencil in lots of doggy play dates. Plenty of mental stimulation will be very important to prevent your dog from getting bored. Boredom is one of the challenges of having an intelligent dog. Plenty of toys are a must and some Huskadors may benefit from puzzle toys, although they do require some patience. This breed requires a reasonable amount of care. They will need regular grooming at least twice a week alongside other normal tasks like flea treatment, nail clipping and cleaning their ears. In addition to grooming, they need lots of exercise and would really need to be living somewhere with a backyard. They are very people oriented and thrive in company. This breed would suit an active family with at least one person at home for the majority of the day. The Husky Lab Mix will require a minimum of an hour of exercise each day; ideally this should be split into multiple sessions. They will also need lots of opportunities to run off leash in a backyard. You can also let them off their leash on walks as long as you have mastered the art of recall. Being highly energetic and intelligent, you and your pup may really enjoy attending some local agility sessions. Another activity that your lovely dog may enjoy is swimming! This is a great form of exercise for them and a lot of fun to watch. Just stand clear when they shake – those coats can hold a lot of water! Your pooch will require grooming a minimum of twice a week. This full thorough brush will help reduce the amount of hair breaking and falling out. 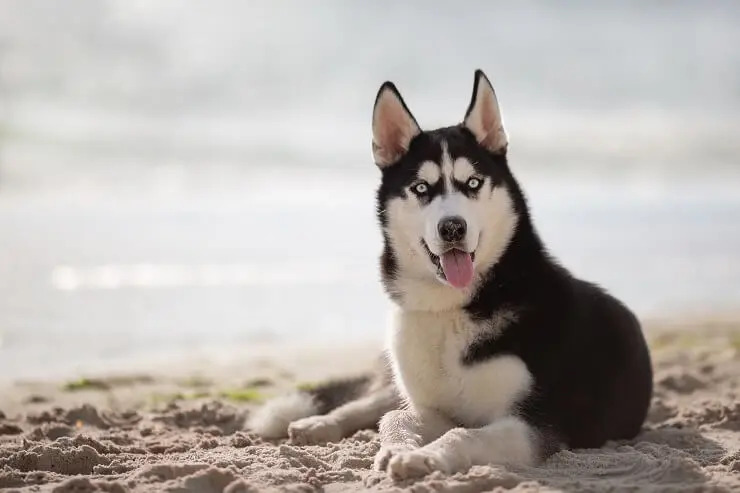 Also, due to the possibility of inheriting the Husky’s double coat, they may shed profusely twice a year during Spring and Fall. At these times, it may be beneficial to take them to be professionally groomed. In addition to their regular grooming you should also be cleaning their ears, clipping their nails and bathing them. When you get your puppy, it’s likely the breeder will have them on a specific food. You should keep your puppy on this food and very slowly start to transition them off this. You can do this by mixing the old and new food together and gradually increasing the ratio of new food. 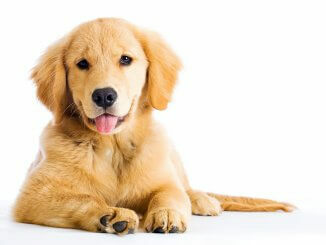 As a puppy they should be on 3 to 4 feeds a day, and at around 6 months old, this can move to 2 feeds a day. Up until they are one you will want to feed them on puppy feed. On their first birthday you can move them on to an adult food blend. The main difference is that puppy foods have more protein. An adult Husky Lab Mix should be on around 2.5 cups a day of a complete dry food. Good dry foods will be high in proteins and at least a quarter of a dog’s diet should be protein. Avoid any food that contains artificial colorings, rendered fats and corn/wheat gluten. The major health concerns for these beautiful cross breeds are hip dysplasia, eye conditions and skin conditions. When you get your puppy make sure to look into the medical history of both parent dogs. At a minimum, both parents should have clear eye tests and the Labrador should have good hip and elbow scores as well. Like other Labs mixes, obesity can also be a real issue; meaning they are more prone to arthritis and other joint conditions. As Huskadors can also be prone to heart conditions, you want to keep a close eye on their weight. Regular vet visits are always a must with any dog and will help you to keep an eye on your dog’s weight and any other conditions they may develop. How Long Do Husky Lab Mixes Live? A Husky Lab Mix will live between 10 to 15 years – which for a larger breed, is a good age. When buying any puppy you should always look for a reputable breeder. You should be able to meet both parent dogs or at a minimum the mother dog and interact with her and see her with the puppies. This will give you an idea of the kind of traits the puppies might have inherited. Although it really is random, there are certain tests you can try with the puppies if you are looking for specific characteristics. 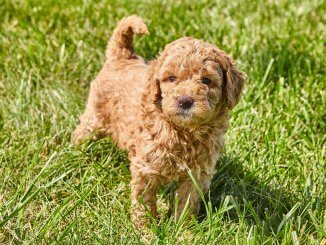 As a tip, you should look for a breeder that favors working dog characteristics over aesthetics as these puppies are likely to have better temperaments. For Husky Lab Mixes, as both parents should be pure breeds, you can ask if they are Kennel Club registered and ask to see documentation. You should also ask for medical records from both the parents and a history of the puppies vaccinations, worming, and flea treatment up until the point you are collecting the puppy. Check the puppies yourself to see if they are in good health with clean eyes and ears. A really good breeder will not be desperate to sell you the puppies. They will want them to go to suitable homes, so expect them to ask you questions too. A Husky Lab Mix puppy from a good breeder will cost between $400 to $800. This price may start to rise as the breed rises in popularity. If you are lucky enough to find one at a shelter, adoption prices range from about $50 to $100. The monthly cost of keeping one can be quite high due to their high food intake. With insurance and general cost of maintenance, you are looking at around $120 to $140 a month. The wonderful dog that is the Husky Lab Mix will be a fantastic companion for the right person or family. They are very loyal and loving individuals that will benefit from a very active home with access to a fenced-in backyard. Huskadors would suit living with someone who is at home for most of the day and does not leave them too often. They are very people-centered and want to be with you all the time! They need a minimum of an hour of exercise each day and an abundance of mental stimulation to prevent any destructive behavior.